Spring is most definitely in the air, although I know we are at least a month out from true warmer temps. But in the 'I'm over wool socks and boots' type of dressing, so on warmer days I've been rocking ballet flat, and loafers as much as possible. And by warmer I mean high 30's - mid 40's! Chilly tops of feet are easily negotiable when you have been wearing heavy layers for 3 months! I spotted these last week at Nordstrom & I can NOT get them out of my mind! I can think of sooooo many ways to wear them - from casual work wear to funky weekend jeans and a T.
The blue top my list, the punch of color....but them that lime yellow....or maybe more neutral with pink....Need your help - Start the Voting! Which would you choose?! Should I get them? I love the yellow ones! So fun. I love the blue, followed closely by the yellow with the pink being a not so distant third! And yes, you should totally get a pair! Adorable! I have my eyes on a pair at Madewell but I love the lime yellow! How cute! I definitely need to invest in some shoes that cover the tops of my feet. Ballet flats are just not practical in the cold - a realization I must come to. I'd go for the yellow! Super cute but still neutral enough to wear with a variety of outfits. yes yellow soles, go now. I saw these when I was in KC and said "omg I need these!" I like the yellow and the pink! Love the yellow ones! That color is SO in right now! So cute! I would definitely go for the yellow ones. LOVE! Definitely the ones with the pink soles! Although they are all fabulous! 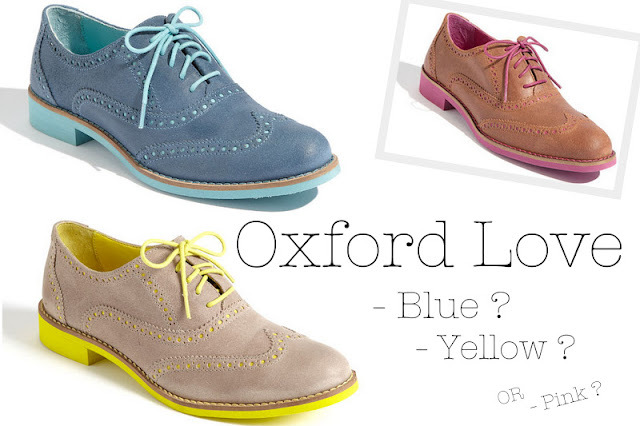 Oxfords are such great investment pieces! Comfy footwear! Gotta support that! I would definitely go for the pink!